I know it's January, but I'm posting a summer outfit anyway. Even in Texas it's officially winter. I actually finished this top and took pictures in early fall, just didn't have time to blog in the last couple of months. This fabric is just too cute not to share though, plus, it's a bit of a foreshadowing of what's to come in 2017. I signed up for my first Ironman race and will be doing a LOT of cycling this spring and summer to prepare. It's going to be my "bike" year. 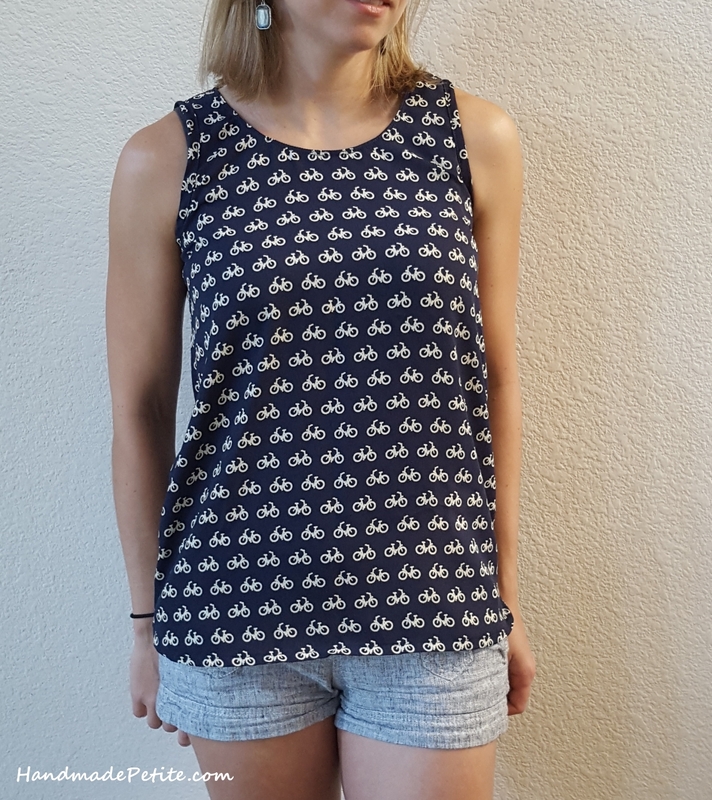 I made this top before the crazy impulse to sign up for the 140.6 mile race, but I've been cycling for a number of years now so of course when I saw this print I couldn't pass it up. It's Telio Robin Crepe fabric from Fabric.com. 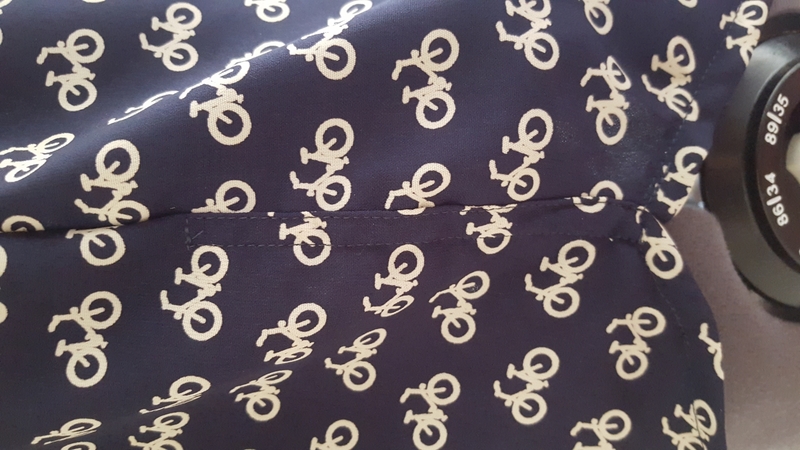 It's called Bicycle print in navy/ivory. At the time of writing this post they still have it in stock. It was a little pricey at ~$12/yd given that it's 100% poly. It's a decent quality poly though and it's opaque. I was happy about this because it meant I didn't have to line it and since it's a crepe, the fabric was pretty easy to sew up to satin. I bought the fabric with a simple blouse in mind. I wear tons of short sleeve blouses in the summer because they're easy to layer with cardigans when walking into my office that can often feel like a meat freezer and the scorching heat outside. 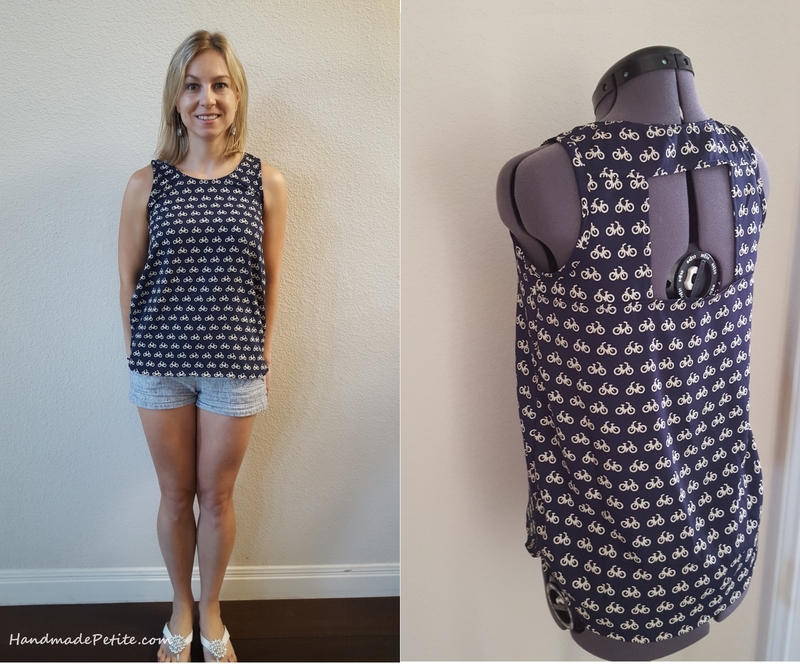 When the fabric arrived and I was leafing through my pattern options, I knew that Simplicity 1589 was it. It's very simple in the front so it doesn't break up the print, but has an unexpected peek-a-boo feature in the back. It's the first time I sewed up the pattern, but it was straightforward enough that I didn't bother with the muslin. There are a few minor fit related things I can improve next time, but all in all the relaxed fit of the blouse is very forgiving. The only real issue I had with this top is the hem. It was folding over fine at first, but for some reason I was ending up with extra bunched fabric after a while. Maybe it would have been better with cotton because I could shrink it with some steam,but I tried resewing it a few times and finally just gave up and folded some of the extra fabric into the side slit and top stitched it to disguise. On the picture it almost looks like an intentional detail, but it adds a little bit extra bulk. All in all I liked the pattern and will make it again with the following changes: hopefully resolve the hem issue, size up for the back panels because my back is a little broad compared to my narrow shoulders, cut out deeper armhole. The last two issues existed partially because I sized down to size 6 get the shoulders to fit and because big 4 pattern companies tend to leave way too much ease in their patterns. This one wasn't too bad though. Next time I may start with 8 and adjust down instead. And there you have it, two of my hobbies rolled into one blouse. Happy sewing or biking to you in 2017 too.